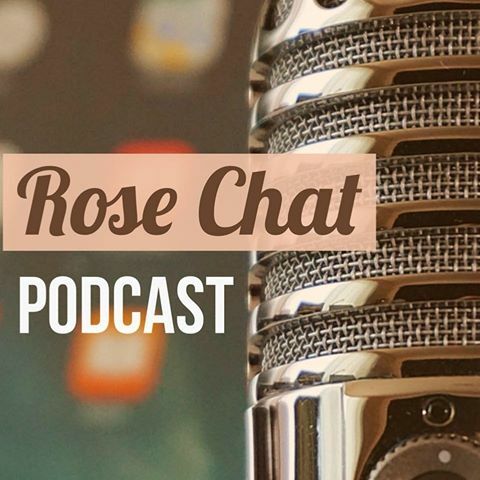 This week I served as guest host for #RoseChat. Our topic for the evening was companion plants for roses. Thanks to @redneckrosarian for the great questions. Q2 I spray my roses with fungicide. Are there plants that are spray tolerant? A2 Companions I find more tolerant of sprays: Yarrow, catmint, coreopsis. Take care NOT to spray clematis. Read labels. Q3 Which are best with roses, Annuals or Perennials? A3 I use a combination of annuals & perennials for continuous bloom. Look for those w/ similar growing conditions. Q4 What is naked knees syndrome? A4 NKS: pesky mid-summer condition of loosing lower leaves… leaving “Naked Knees”. Q5 What is the best cure for naked knees syndrome? A5 Low growing companions with a long blooming season that can take the heat –fill the gap–saying no to NKS! Q6 Can I plant herbs alongside my roses? A6 Herbs look great with roses & some deter pests: Favs: calendula, feverfew, thyme, chives, lavender. Q7 What are some of your favorite companion plants for roses? A7 Fav rose companions: feverfew, moonbeam coreopsis, yarrow, catmint, thyme, lavender, larkspur, ageratum. Q8 I heard that garlic is good to plant with roses. Why? A8 Anything in the allium family helps keep aphids off roses & deters blackspot–garlic, chives, leeks & shallots. Pretty & yummy. Q9 Any other companion plants that help deter pests? Q10 Any climbing vines make good rose companions? A10 My favorite vines to use with roses are honeysuckle, morning glories & clematis. The best thing about Twitter #RoseChat is the sharing of information. For an hour you are linked to an amazing group of like-minded people with an incredible amount of information. It is FUN. It is FAST. It is inFORMative! (Need more convincing… click here for an excellent article from my friend, Paige, of Love Sown. Below is a list of random comments from other participates of #RoseChat. Favorite Morning Glories: Heavenly Blue and Scarlet O’Hara (@bloominchick purchases these from Livingston Seed Co). A combo of Mdm Cecile Brunner and clematis Anita. Give your roses a good start with alfalfa and manure teas from Authenic Haven Brand. I love sage with roses! We grow Iris, lilies, salvia with our roses. The last few years Lavender Provence has worked best for me. Yellow roses look great with purple echinacea, & get lots of pollinators & predator bugs like assassin bug & praying mantis. Naked Knees can be minimized with a good mulching and even moisture. Lemon balm is beautiful and smells great but best in a pot. You won’t like it if it takes over and it will. Peonies make good rosey companions. Often they are a color echo of the roses themselves. Love the look of garlic chives in front and giant alliums mixed in. An elderly gardener told me that pungent herbs kept the bugs off his roses. He had no bugs. I took his advice. Works well. 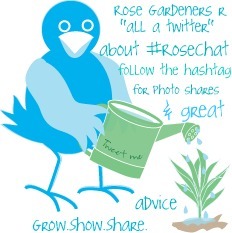 #RoseChat is a great place to learn, grow and have fun with other “rose” people! Join us! What are your favorite rose companions? #RoseChat was great fun. Thanks to all those who participated and shared so much valuable information!